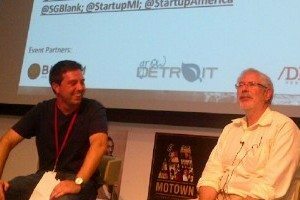 Xconomist and startup guru Steve Blank swept into Detroit last night for a sold-out, wide-ranging discussion at the Madison Building. (Kudos to Bizdom, Detroit Venture Partners, Startup Michigan, and Grow Detroit for packing the auditorium with over 100 people on less than 24 hours notice of Blank’s appearance.) Prone to tangents that are no less insightful than the topic at hand, Blank talked about the new entrepreneurship (and why everything you’ve learned in business school is “crap”), Detroit’s impending re-emergence (and why we should honor Billy Durant just as much as Alfred P. Sloan), why anyone who gets involved with a startup because it’s hip or trendy is a fool destined for failure, his program to train research scientists at universities to be world-class entrepreneurs, and much more. If only the rest of the world knew what Detroit has to offer, we would be growing faster than China.